Sen. Angus King, I-Maine, in Bangor in October. The senator said natural gas is at the forefront of an energy revolution and transformation in the country, but he worries about potentially escalating prices and exports of liquefied natural gas because of New England's and Maine's heavy reliance on the fuel for electricity generation and home heating. Natural gas, which already generates more than half of New England’s electricity, could become the go-to fuel for both electricity generation and home heating during the next 20 years or more until renewables like solar, wind and potentially hydroelectric gain market traction. The federal government as well is looking at liquified natural gas, or LNG, as a potentially lucrative export for the country. That’s according to experts at a natural gas industry conference held by Portland law firms Verrill Dana and Pierce Atwood at The Woodlands in Falmouth on Thursday. 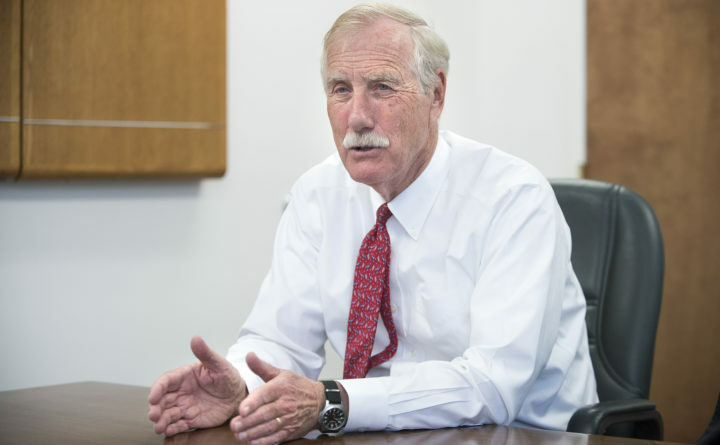 Natural gas has become a big player in the energy world in both New England and Maine during the past 20 years, Sen. Angus King, I-Maine, said in a pre-recorded video played to conference attendees. “Natural gas is at the forefront of an energy revolution and energy transformation in this country,” King said. Natural gas generated 5 percent of New England’s electricity in 2000 compared to 64 percent now, he said while reading the numbers off the free ISO to Go mobile phone app. He said that app gives up-to-date information on the electrical energy market in New England and the price of energy by state. 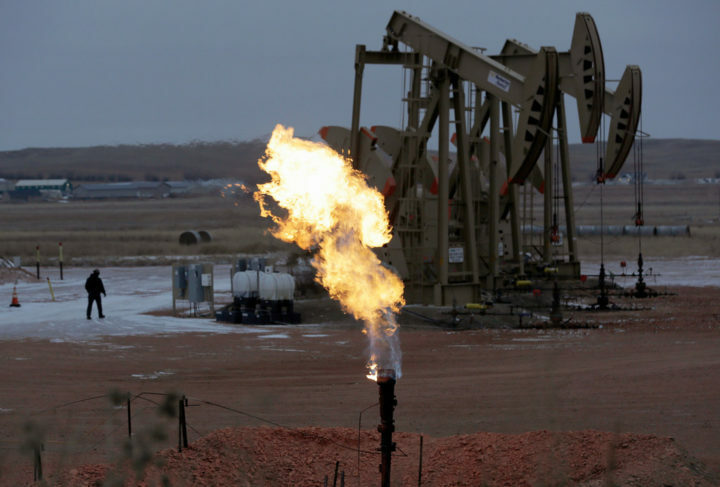 Workers tend to oil pump jacks behind a natural gas flare near Watford City, North Dakota, Oct. 22, 2015. King said that is good news because natural gas burns more cleanly than coal and oil, so the carbon dioxide emissions are lower and less damaging to the environment. Also, the price had been favorable. “It worries me that we may be at an all-time low in price and headed back toward the usual price,” he said. “It’s $2.50 now, and I’m worried we’re headed to the $4, $5 or $6 level, which could really impact Maine in terms of our reliance on gas for home heating and for electricity,” he said. The prices are in dollars per 1,000 cubic feet, which is how natural gas is measured. King said he also worries about Maine’s huge dependence on natural gas at a time of historically low prices. “That’s something we need to bear in mind as we think of the diversification of our energy supply,” he said. King also said he is concerned about the federal government’s focus on growing exports of liquefied natural gas, which is gas cooled to a liquid for transport or export. King, who serves on the U.S. Senate Committee on Energy and Natural Resources, said the committee during the past year has been discussing the potential growth of LNG exports. The Federal Energy Regulatory Commission, which is responsible for getting reliable, efficient and sustainable energy for customers, has about 14 major LNG export projects in the works, King said. King said he did a back-of-the-envelope calculation and found the proposals for LNG exports are more than 50 percent of the current annual production. “This is something we need to be concerned with and keep an eye on over the next couple of years,” he said. Do we need more pipelines? King also asked the participants to look at the natural gas pipeline capacity in New England and Maine. He said a cold snap last winter caused gas shortages in the region and asked them to consider whether the region needs more pipeline capacity. The Conservation Law Foundation, an environmental advocacy group that is speaking on a panel about expanding the pipeline, has said New England doesn’t need to add to it. Greg Cunningham, CLF’s vice president and director of clean energy and climate change, wrote in a January 2018 commentary on the organization’s website that New England’s energy system held up well during that month’s frigid snap and the “bomb cyclone” of heavy wind and snow. “The reality is that while the cold drove up wholesale energy prices — particularly during the few hours each day when power demand is at a peak (mostly mornings and evenings when we’re all at home) — our energy system weathered the frigid temps remarkably well, and clean energy excelled,” he wrote. He said hydropower and renewable energy generated 20 percent of the power during the cold snap, making up for the drop in gas-fired power. Maine Natural Gas in Brunswick, Northern Utilities/Unitil in Portland, Bangor Natural Gas in Bangor and Summit Natural Gas in Augusta provide natural gas to customers in Maine. Rumford Power runs a natural gas-fired power generation plant in Rumford, while Casco Bay Energy runs a plant in Veazie. William Harwood, a partner at Portland law firm Verrill Dana, said Maine initially was getting a lot of natural gas from a line that runs from Sable Island through Nova Scotia and then through Maine from Calais to Bangor to Augusta and to Portland. Another line runs from Montreal to South Portland. Harwood said it makes sense now to tap and possibly expand geographically closer lines from northeastern Pennsylvania, which is rich in the Marcellus shale that contains natural gas. 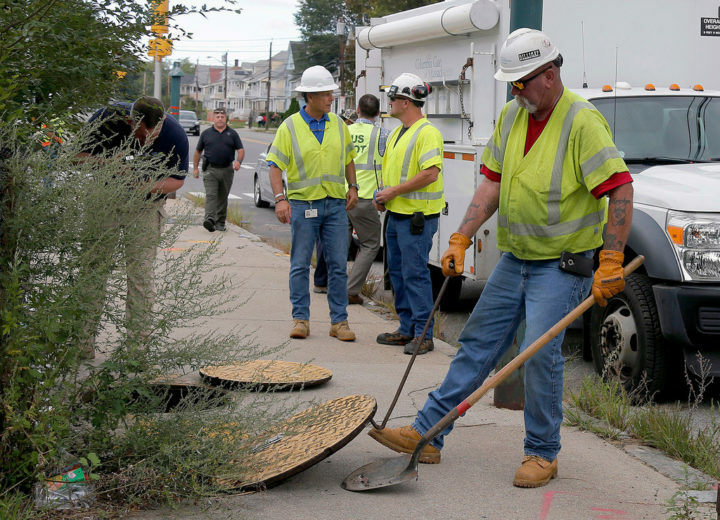 A worker with Columbia Gas pries a manhole cover open as they work to make sure there are no gas leaks at the corner of Parker and Salem Streets in Lawrence, Massachusetts, Sept. 14, 2018. However, that gas is extracted by a controversial drilling practice known as hydraulic fracturing or “fracking,” which some environmentalists and health officials have claimed has negative environmental and health consequences on nearby residents. A big question, Harwood said, is where natural gas fits into the climate debate. While it burns cleaner than coal or oil, it isn’t as clean as newer technologies like solar. While half of Maine’s power is generated by natural gas, two-thirds of Maine homes still are heated with oil. Harwood doesn’t believe oil heat is sustainable long term, especially with warming oceans and other signs of a changing climate. He said anyone living or running a business within 10 miles of one of the current pipelines should consider changing to natural gas. Other advantages he cites with natural gas are that the pipes are underground and the supply comes through automatically, so trucks don’t have to haul oil or propane to homes and have the drivers climb over snow banks to make deliveries. The Maine Office of the Public Advocate shows the natural gas pipelines in the state on its website and gives some approximate costs for conversion. Natural gas conversions are growing slowly, Harwood said, but they could see an uptick if the price of oil rises to $100 per barrel, as some market experts are predicting because of global political tensions. The price of the U.S. benchmark West Texas Intermediate oil was $70 per barrel Wednesday afternoon. Harwood said it still isn’t clear whether Mainers are hesitating to install natural gas in the wake of well-publicized incidents of safety issues, including a gas leak that caused an Augusta Applebee’s restaurant to be evacuated in February 2016 and the explosions in three Massachusetts towns in September of this year that damaged dozens of homes, killed a teenager and injured dozens of people. One issue that may cause Maine natural gas suppliers and distributors to consider increasing supplies and expanding pipelines is unexpected cold weather snaps, like the one last January. Harwood said when natural gas supplies to generate electricity were in short supply, the fallback position was to divert some of the oil normally used to heat homes to instead generate electricity, in turn causing tight supplies and some rationing of heating oil. “All energy is interrelated,” he said. Conference speakers and panelists included Mark Vannoy, chairman of the Maine Public Utilities Commission, and Public Advocate Barry Hobbins; and representatives from regional transmission organization ISO New England, New England Power Generators Association, Conservation Law Foundation, Tennessee Pipeline, Bangor Gas, Calpine Corp., Emera New Brunswick and the Northeast Gas Association, among others.